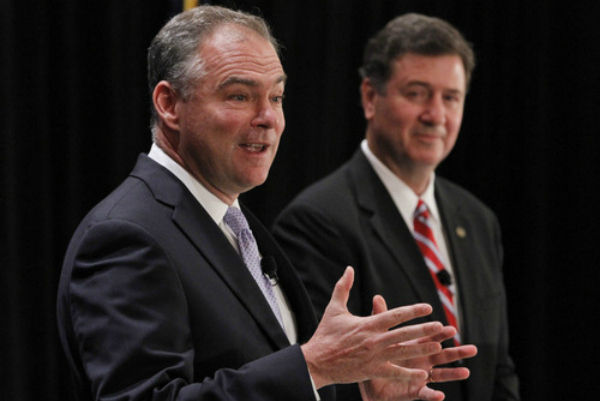 For nearly a year and a half, Virginia Republicans have attempted to tie President Obama around the neck of U.S. Senate hopeful Tim Kaine in hopes of dragging down the Democratic ticket in this potentially pivotal battleground state. But after Mitt Romney went to Norfolk on Saturday to announce his running mate, Democrats say they have been handed a corresponding target of opportunity in the person of Paul Ryan. The logic of the GOP strategy of using Obama to undermine Kaine has always depended on a leap of faith for which there was little empirical evidence: Obama carried the Old Dominion by seven percentage points in 2008 and is still relatively popular there. Likewise, the Democratic Party’s emerging strategy of demonizing Rep. Ryan simply assumes that Virginia voters know who he is and are hostile to his idea of reining in federal entitlement spending. Nonetheless, an emerging Democratic Party strategy in congressional races across the country has hinged upon the budget Ryan proposed in the House, which would phase Medicare into a voucher system and lead to the privatization of Social Security. Now, Ryan’s presence on the ticket bolsters this Democratic attack plan, which accuses Republicans of threatening seniors’ benefits. But the impact of the Ryan budget proposal is nuanced -- for one thing, the Medicare changes wouldn’t impact anyone born before 1958 -- and especially so in Virginia, where the Senate race is so closely tied to the presidential. And by introducing his No. 2 in the Old Dominion, Romney signaled how important the state is to his candidacy. Allen’s main strategy during this campaign has been to nationalize the race and pin his opponent, a former governor but also a former Democratic National Committee chairman, to health care reform, the stimulus package, and the president’s energy policy. Unlike Kaine, Allen had to first beat back challengers in his party for the Senate nomination, and was cautious about fully embracing Romney and taking a position on the Ryan budget. “George Allen is understandably hesitant and wants to run on his own brand,” says Ford O’Connell, a Virginia-based Republican strategist, noting that seniors constitute 12 percent of Virginia’s population. Even after easily winning the primary, Allen has not endorsed the Republican budget plan. He has said he commends Ryan for advancing the debate on serious fiscal issues, and has called it a “worthwhile proposal,” but remains focused on his own plan to comprehensively reform taxes and to cut spending.